The Dutch pianist and singer Marijke van Duin studied the piano at the Sweelinck Conservatorium in Amsterdam with the internationally known Dutch pedagogue Jan Wijn and the American Edith Lateiner-Grosz. She graduated for solo performance as well as for chamber music. Later on she studied with the Russian pianist Naum Grubert and followed master classes with Gary Graffman, György Sebök and Jacob Lateiner in the United States. As a solo pianist she played in major international piano competitions, such as the Queen Elizabeth Competition in Brussels, Belgium, and the Robert Casadesus Competition in Cleveland, United States. As a chamber musician she concentrated on duet playing with violin as well as on pianoduet. She formed successful duets with the Dutch violinist Marieke Blankestijn and the Polish-British pianist Elizabeth Mucha. She gave concerts throughout Europe, a.o. in the Amsterdam Concertgebouw, Rome, Berlin and London and recorded for Dutch and German radio and television. Furthermore she made recordings for the Dutch feature film Quatre Mains. Later on she specialized in contemporary piano music and recorded on CD all works for piano solo by the Dutch composer Wiel Conen. Marijke van Duin is also a mezzo soprano and studied with the Dutch mezzo Marion van den Akker. After her graduation as a teacher in solo-singing she continued her studies with the German mezzo Christa Pfeiler. Her main focus is on lied interpretation. Piano lessons are given in Marijke’s private studio not far from Amsterdam Central Station, equiped with a Mason & Hamlin concert grand (2.11m, 1974) and a Yamaha S4 grand (1.90m, 1994). 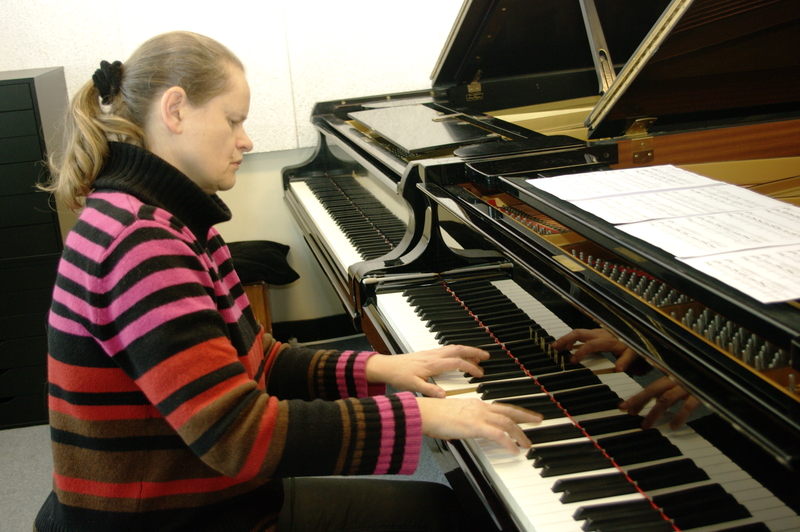 Marijke trains professional students via the Schumann Academy, as well as well-advanced amateurs and semi professionals. The focus lies on classical piano solo repertoire, accompaniment and chamber music. Each year workshops and student concerts are organised. For rates see tarieven. Singing lessons are given in Marijke’s private studio not far from Central Station. Much attention is given to posture, breathing and voice technique and -training. Repertoire can be a variety of classical songs (lieder), folksongs, musical, choir works, oratorium and opera. Languages include English, Dutch, German, French, Italian, Spanish and Russian. Students can perform at workshops, student concerts and at Cantina Vocaal. For rates see tarieven. Classical music is sadly on the decline, at least in Western Europe. I see two main causes for that. First of all music education has been neglected for decades, certainly in the Netherlands. Many young people have therefore never experienced classical music and know nothing about it. Secondly music interpretation has suffered a great deal from ‘academism’ since ca. 1970. For fear of being labeled a ‘romantic’, personal emotions and vulnerability could simply not be tolerated in professional music making. Hopefully it is not too late to reverse this trend. Let’s offer (young) music lovers real live music again, with flesh and blood, and true meaning. And let’s hope this will generate new interest for classical music. It is my mission to contribute to that.